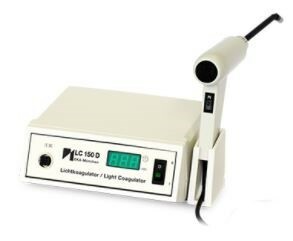 The infrared contact coagulator consists of an infrared radiator, a rigid light guide curved at the end at which the light emerges, and a tissue contact surface or tip made from a Teflon® polymer that is transparent to infrared and does not adhere to the tissue. The infrared radiation is focussed into the light guide. A low-voltage tungsten-halogen lamp (15 V) produces the beam in a gold-coated reflector housing. The red light and infrared leakage radiation is allowed to escape outside through the red lamp casing, thus preventing the coagulator from overheating and making it unnecessary to provide an expensive cooling system. The optimal amount of energy to be transferred into the tissue can be pre-set exactly by means of a timer and reproduced at all times. The ergonomically designed applicator, fitted with a hand-operated switch and supplied with low voltage by means of a flexible lead, enables the doctor to work in a simple and convenient manner.